Azerbaijan’s state oil company SOCAR is welcome to take part in construction of Albanian gas infrastructure, Albanian Ministry of Infrastructure and Energy told Trend. In this regard, the ministry said that the Master Plan on the Gasification of Albania was approved by the Council of Ministers by Decision no. 87, dated 14.02.2018. "In accordance with this Master Plan several gas infrastructure projects are developing. Among the important projects is also the gas pipeline project that will link the TAP project with TPP Vlora," said the ministry, adding that companies that will apply for the concession reconstruction and operation of TEC Vlora, are expected to show interest in financing this project. 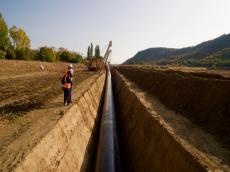 Based on the application of the Ministry of Infrastructure and Energy in the 20th round of the WBIF, a grant of 1.1 million euro was approved for the preparation of the detailed technical design for the pipeline connecting the TAP project with TPP in Vlora, said the ministry. "Azerbaijan’s state oil company SOCAR is welcome to participate in the construction and operation of gas infrastructure, as well as in the gas supply of the various sectors of the Albanian economy," said the ministry. Based on the Gas Master Plan, as well as on the "National Energy Strategy for the period 2018-2030", the development of the gas sector will be a strategic priority, according to Albanian ministry. Head of SOCAR Balkan Murad Heydarov earlier told Trend that SOCAR is considering various forms of participation in Albania’s gasification.